With EarthWatch, you have access to millions of square kilometers of streamed imagery with low cloud-cover and off-nadir angles. This data is accessible in web-mapping services and in an online viewer. Perhaps the most important feature of EarthWatch are the regular streaming updates you can receive as out-dated imagery is often of little or no use to our valued clients. And if the EarthWatch streaming database lacks the coverage you need, Premium users are now able to download any image from the entire DigitalGlobe archive (minus IKONOS data) in a wide variety of formats! 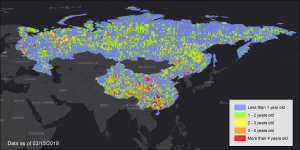 The available DigitalGlobe EarthWatch imagery over China and Russia by location and with the most recent coverage date indicated with varying colors. In the vast majority of locations, there are multiple imagery dates available. Without question the biggest news we have this month is the addition of direct data downloads (Premium users only) from the entire DigitalGlobe imagery archive (minus IKONOS)! This is an exciting change, particularly for clients looking for orders well below the typical minimum of 25 square kilometers for offline GeoTIFF deliveries. Send us an email at sales@apollomapping.com if you would like to find out more about this exciting new offering! Product Formats: all standard types are offered including, orthoready, stereo, basic, 4-band bundle, 8-band bundle, ACOMP on, etc. For more information on the pricing and coverage available in DigitalGlobe’s EarthWatch, you can reach our sales team anytime at sales@apollomapping.com or during typical American business hours at (303) 993-3863. This entry was posted in The Geospatial Times and tagged DigitalGlobe EarthWatch, EarthWatch, imagery archive, monthly spotlight, The Geospatial Times by Apollo Mapping. Bookmark the permalink.